How can friends that have shared so many important moments recapture that closeness after circumstances have separated them? This is the root of the question that Rachel asks herself when her best friend returns home after an absence of seven years. Clara’s return to Brighton came after Rachel was already a successful crime reporter for television. Living in London with the man of her dreams she is perturbed that the previous closeness they’d shared was hard to recapture but she still classed Clara as her best friend so when she is sent to report on her sudden disappearance Rachel doesn’t know what to think. Set between the present in 2007 and the past in the early 1990’s, the book is written in a form of a (long) letter to the lost Clara. I like the way the time shifts were done, sometimes they can seem contrived but as this was a letter the memories that Rachel chose to mention seemed relevant. I have to admit I don’t normally like the second person in books, but again my fascination overcame my usual irritation. I found the book a compelling read, watching how time has shifted the balance of power in the relationship, Rachel is no longer a shy schoolgirl and it is unclear for most of the book what changes Clara has undergone. I like figuring people out and there was plenty of opportunity to look for motivations and reasons within the claustrophobic friendship that the two girls had. Colette McBeth has written a very clever book, one that I could hardly bear to put down and I found myself snatching a few pages at every available opportunity, something I haven’t done for some time! The short punchy sentences kept me reading while I tried desperately to work out what had happened to Carla, and why. I was only partially successful. The cast of characters is quite small, wonderfully observed and seemingly realistic, and although I didn’t particularly like either of the two friends, they were definitely interesting. The scene where Rachel met Sarah, an old school-friend, for the first time since leaving school was so accurate, mimicking the way some women talk, disseminate and manipulate, that I could imagine I was at the Cantina Latina club with them. So if you hadn’t guessed already, I loved this book. 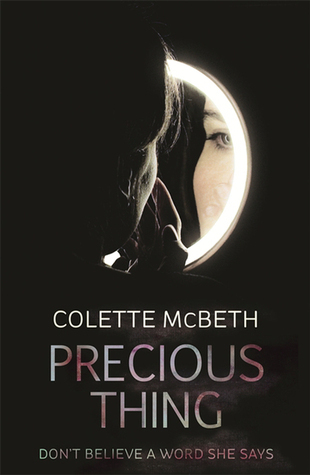 Precious Thing was a fairly quick read, not too taxing, but plenty to think about, and just what I expect from a good psychological thriller. I received my copy of this book from Amazon Vine in return for this honest review. I’ve heard nothing but good things about this book and now I’ve read your review. I really must read it! Definitely going to try my luck in the giveaway – thanks for the heads up. It sounds sooo good! Thank you FF – I loved this one, rarely does a book really deserve the comment ‘I couldn’t put it down’ but I managed to read while cooking dinner, the dinner could have been better but the book could not have been! I am adding this one to my list. I love a seamless time shift. Yay! A book on friendship is also a major plus, and I don’t even mind that this one is a thriller, of sorts. I found this a deceptively simple book with a look at what happens to friends as they grow up. It is about the motives behind the thrills rather than an action led plot. I hope you enjoy it as much as I did. Sounds great. I will try to remember to come back and let you know what I thought. Great review. Thanks for the tip about the giveaway on Goodreads. Will have a go.